RGS Vacuum Systems offers a pneumatic conveyor system suitable to transfer mixed powders with different specific weights : with an high depression and low flow rate , you can keep the homogeneity of the product. The loading hopper Ø220mm is realized in stainless steel AISI 316L mirror polished , with 9 or 15 lt of capacity. 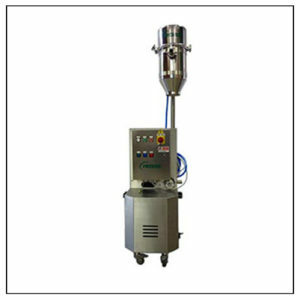 It is combined with an high vacuum pump with painted or stainless steel housing, available with different powers. This pneumatic conveyor is especially used in chemical, pharmaceutical and food industry. RGS can realize complete systems with loading cells and dosing systems, according to customer specifications.